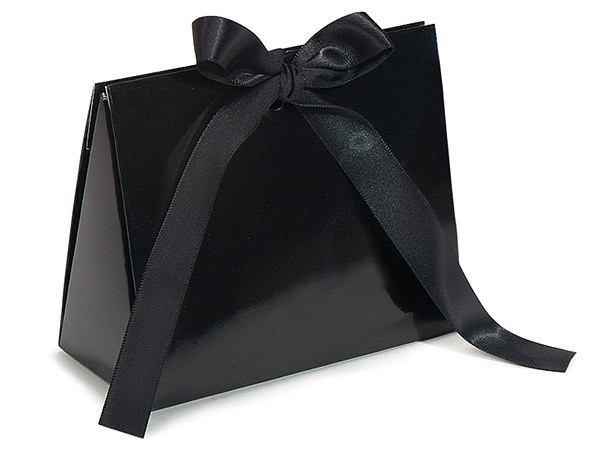 Black Gloss Purse Tote Gift Bags, Small 4.5x2x3.75"
Small 4.5 x 2 x 3.75" Large 8 x 3.5 x 5.5"
Personalize these bags by calling our Custom Print Department at 1-800-547-9727 ext. 4 before ordering. Purse shaped gift bags are great for party favors, gift basket stuffers, and jewelry packaging. Large and small size available. Totes are made of heavyweight laminated paper and have a ribbon closure. Totes are shipped flat. Ribbon closure is included. Shipped direct from factory.